I am small breeder located in Central Texas...In the heart of dove country...Hence, the name 'Paloma' (Pa Loh Ma), which means 'dove' in Spanish. My Love for the Labrador Retriever was the driving force behind me establishing my own kennel. My kennel is located in Central Texas..
As a breeder, I take it very seriously and plan each litter way in advance with hopes in keeping a show prospect or two. I also want to provide our pet buyers with a quality pup that they will be proud to own and one that fits their family life style. I sell all my pet puppies on AKC limited registration. This means we DO NOT sell puppies or adult labs for breeding. Please read our PET CONTRACT. 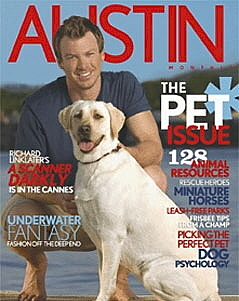 This is Marley, from an earlier litter, in the Austin Monthly July 2006. All our labs were selected for type, temperament and workability. All my Labs are beloved members of my family and have OFA and CERF clearances before making them part of the breeding program. As I am still a young kennel, only established in the year 2000, I hope my Labradors make as much an impact in the Labrador world as their lineages before them. I am a member of the Heart Of Texas Labrador Retriever Club.